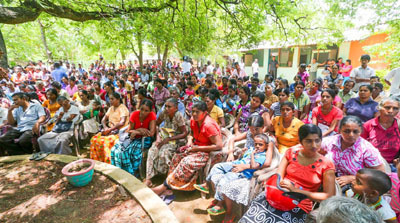 Prime Minister Ranil Wickremesinghe revealed that the Government of Sri Lanka plans to launch a nationwide programme to provide women with financial assistance to introduce grassroots projects. Addressing a workshop at Temple Trees to educate women, he stated that the project would be implemented with the direct contributions of women and that the government is studying mechanisms to be adopted for its implementation. This would be in addition to the Gamperaliya programme where women are also expected to have a role. The prime minister noted that this year was unique as the number of women representatives in local government was increased from one percent to 22 percent, which the government intends to increase to 25 percent.